Take a trip to the world’s most famous canals (no, we don’t mean Birmingham) in Hearts of Venice, a 5 reel, 50 payline video slot from WMS. This particular gondola ride comes with mystery symbol transformations, re-spins with frozen wilds and a free spins bonus feature. Stakes rage from between 40p and £200. Considering that Venice is one of the world’s most iconic destinations, we hoped that this video slot would be a visual dazzler – sadly, we were a little underwhelmed on that score. The imagery is a little blocky and though perfectly serviceable, lacks the wow factor found with slots from some other developers. Symbols on show include a gondolier’s hat, pillars, rope, a red rose, gondola, lamp, bridge and statue. The top paying symbols are the stripy shirted gondolier and the woman with the rose. The Hearts of Venice logo is the wild, replacing everything bar the feature and reveal symbols. The heart is the reveal – when it hits fully stacked on reel 1, you’ll trigger the Hot Hot Re-spins feature. The stacked hearts are held in place and you’ll be awarded 2 re-spins with any hearts that land also being held in position. After both of the re-spins are complete, all of the hearts will be transformed into the same random symbol, offering some great winning chances. To be in with a shot of triggering the re-spins, you have to pay an extra 15 times your line bet on each spin. (For example, if you’re playing the minimum 25p for all 50 paylines, you’ll pay an extra 15p to access the Hot Hot Super Respins, taking your total investment to 40p per spin). 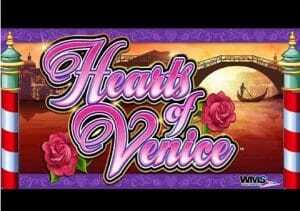 Hearts of Venice also comes with a Free Spins feature which is triggered by landing 3 of the silhouetted couple scatter symbol. Here you’ll be awarded 10 free spins with extra wild and reveal symbols added to the reels, making it that much easier to trigger the Hot Hot Re-spins. Land 3 more scatter symbols on reels 1, 2 and 3 and you’ll re-trigger the feature and earn another 10 free spins. The free spins also come with a guaranteed payout of at least 400 times your line bet (or 10 times your stake). Despite the slightly lackluster visuals, Hearts of Venice does still have its charms – fill the reels with a high value random symbol and the re-spins can deliver rich rewards. The free spins feature isn’t bad either. This medium variance offering may not be as iconic as the city on which it’s based but the Hot Hot Re-spins make Hearts of Venice worth a visit. However, there are better WMS land based classics out there to be played online including the iconic Zeus.